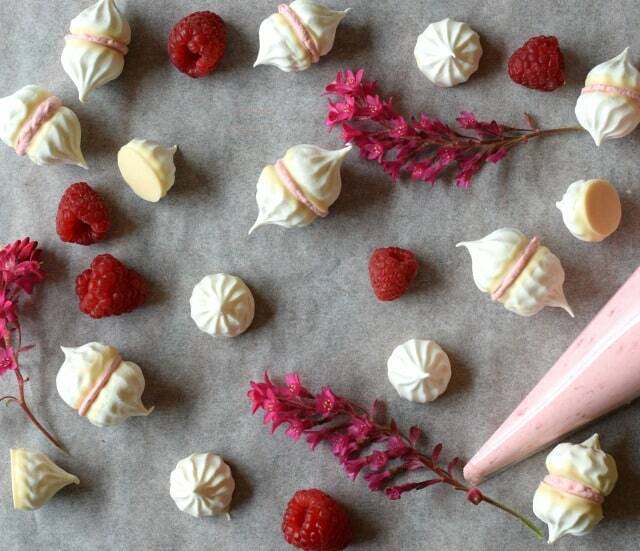 These Raspberry & White Chocolate Meringue Kisses are as delicious as they are pretty. They combine a popular flavour combination which works so well accompanied with meringues. These pretty little raspberry & white chocolate meringue kisses came about after carrying out a side-by-side-baking comparison this past week. The four way look at meringues left me with masses of meringue kisses, which I clearly needed to use in some way. 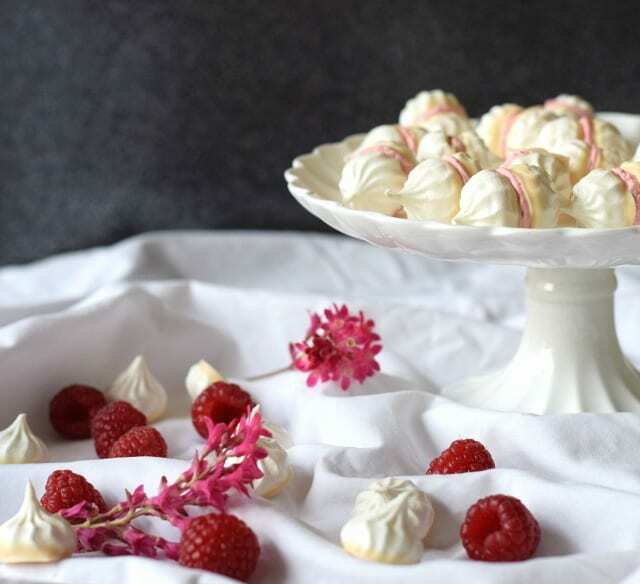 The dainty shape of these meringues certainly lent themselves to being combined with some good flavours as well as a feminine and girlie colour. And surely there’s no colour more girlie than pink! A handful of a few fresh raspberries crushed into some whipped double cream created the perfect shade of pink for sandwiching together these lovely meringue kisses. And the white chocolate not only complemented the raspberries perfectly, but also helped to protect the meringues from spoiling quickly from the moisture of the raspberry flavoured cream. Although I made my own meringue, there really is nothing stopping you from using shop bought meringues which would be a huge time saver if you don’t have a few hours to allow a homemade mixture to bake and dry ot in the oven! These little raspberry & white chocolate meringue kisses were so deliciously moreish. Once I’d shared a few with our elderly neighbour (who loved them too), the remainder were soon demolished. Even though there was only a comparatively small amount of white chocolate and raspberry in each meringue sandwich, that classic flavour combination came through loud and clear, making them incredibly enjoyable. The dainty nature of our meringue kisses make them perfect for summer parties, just in the same way as our Chestnut & Chocolate Meringue Sandwiches are perfect during the Christmas festivities. Though you could easily make them suitable for a dessert by making the meringues larger. 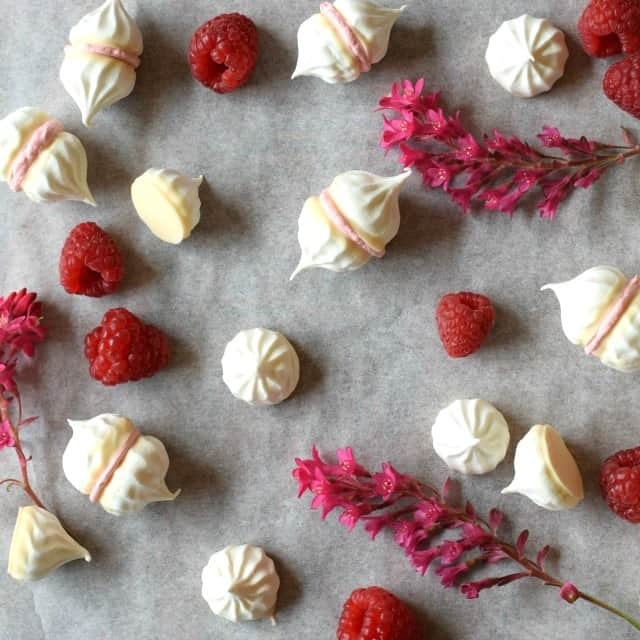 So, here’s how to make Raspberry & White Chocolate Meringue Kisses. which works so well accompanied with meringues. 1. Preheat the oven to 120c / 100 Fan / Gas 1/2.2. Prepare a baking sheet. Cut a sheet of greaseproof paper large enough to base line a baking sheet. If you want your meringues of identical size, draw around a shape (perhaps a small glass, biscuit cutter or coin) that is about 2cm in diameter. Turn the paper over so that the pencil marks are on the underside. Use the paper to base line a baking tray.3. Make the meringue. Using a scrupulously clean and dry bowl and beaters (or balloon whisk), beat the egg white. Once it has increased in volume and is at the soft peak stage, gradually add the sugar 1 teaspoon at a time. Continue to beat the meringue until all of the sugar has been incorporated. The meringue will now be glossy and very thick.4. Shape the meringue. Spoon the mixture into a piping bag fitted with a star piping nozzle. Pipe the meringue onto the prepared baking sheet (use the circles as a guide if using). You should be able to get around 30 – 40 small meringues. Any shapes you’re not happy with can easily be lifted back into the piping bag with a pallet knife (or similar), allowing the mixture to be re-piped. 5. Bake. Place the baking tray into the centre of the oven and bake for 1 hour. After the baking period has ended, turn the oven off, DO NOT open the oven door, allowing the meringues to cool slowly in the oven. Remove the meringues after at least 2 hours of cooling in the oven. If the baking tray is still a little warm return them back to the oven to cool further.6. Melt the chocolate. Break the chocolate into a bowl and set it over a pan of barely simmering water, ensuring that the base of the bowl doesn’t touch the water. Allow the chocolate to melt, stirring frequently. Once melted, remove the bowl from the pan and set it on a teacloth / sheet of kitchen roll. 7. Dip the meringues. Cut a sheet of greaseproof paper and lay it on your work surface. Dip the base of each meringue into the melted chocolate one by one. Remove any surplus chocolate by gently wiping it on the spoon / spatula. Set the dipped meringue on the greaseproof paper to allow the chocolate to set.8. Pair up the meringues. Once the chocolate has set, pair each of the meringues with ones of equal / similar size.9. Make the raspberry cream filling. Pour the cream into a bowl. Use a balloon or egg whisk to beat it until it is almost at soft peak stage. Break up the fresh raspberries and add them to the cream. Combine the raspberries and cream together. Whip the mixture a little more as necessary, though avoid over whipping. Spoon the mixture into a piping bag fitted with a plain round nozzle (though it would also work with no nozzle fitted).10. Assemble the meringue sandwiches. Pipe a little of the raspberry mixture onto the flat side of one of the meringue shells. Sandwich with the meringue’s pair. Set onto a serving plate. Repeat with the remaining meringues. 11. Enjoy! a) Store the meringues in an airtight container until you are ready to coat them in chocolate and assemble them. b) Proceed with step 6 and beyond up to 2 or 3 hours before the meringue sandwiches are required. c) Use a clean dry cloth to wipe any chocolate from your fingers when dipping the meringues – this will help prevent the chocolate marking the white surface of the meringues, though if this happens consider dribbling any unused chocolate over the arranged meringue sandwiches to disguise the marks. d) You’re likely to have some raspberry cream left over. Either use this with another bake or serve it in a bowl for guests to dip into with meringues or other foods. 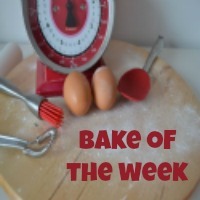 Bake of the Week co-hosted by Jenny at Mummy Mishaps and Helen at Casa Costello. Raspberry & White Chocolate is one of my all time favourite combinations…… and don't get me started on meringue! These look and sound super yummy! I had that sameproblem Corina – they were so delicious! Aw thankyou Eb 🙂 It's amazing how a a splash of pink can make things instantly girlie isn't it. The side by side will be posted soon, I must admit I was a little surprised with the results.